There are some experiences that require documenting and sharing. If only as a show of your bravery, resilience and honest to God badassness. A Sterling College Expedition is one such experience. Some may argue that there are more pleasurable ways to get such an experience and I agree, however, there is something to be said about surviving this particular one. Imagine you are going on a 4 days and 3 nights off trail hiking trip. 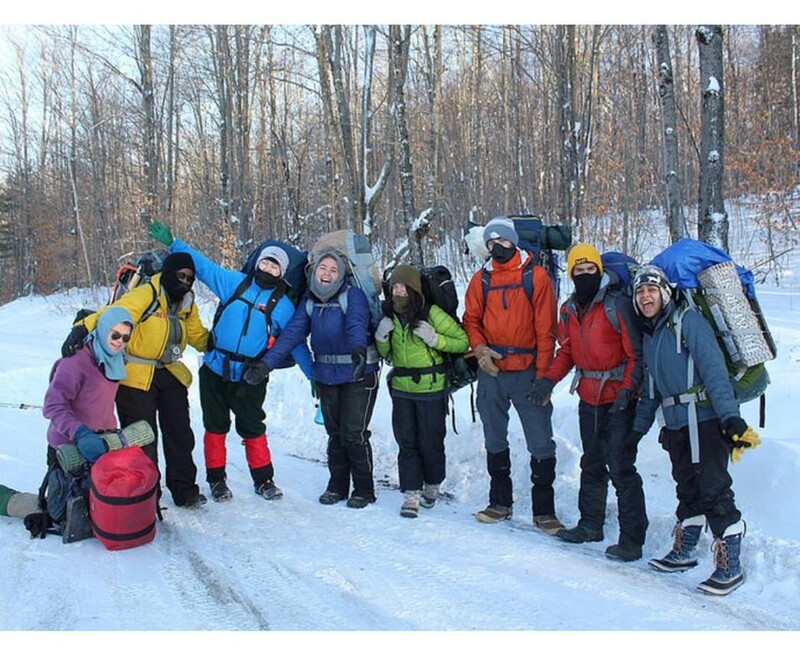 You have a 45–60lbs pack on your back, trekking through slightly below knee high snow, with a group of about 30–50 people, in temperatures that don’t get above 0 degrees Celsius. Matter of fact, imagine that on the first night, the temperatures fall to -10F, an equivalent of -23C. Imagine that you sleep under a tarp. That’s it. A blue tarp. The only thing separating you from the ground is the clear plastic placed to the bottom and your sleeping pad. You gather wood from around to light a fire. You get water from a nearby stream to drink and cook. You take turns reading the map to navigate the group back to campus, safely. Your day begins at 6am and ends after you get to and set up camp for the night. You basically spend 75% of your time awake hiking. No cellphones. No showers. No toilets. No luxuries. You are appreciative of a lot while you’re out there. The kindness of people who, before then, you hadn’t said more than two words to. The ones who carry your 45–60lbs pack on their head or their front because you aren’t well, while their own 45–60lbs pack is on their back. The ones who help you get up and over steepness. The ones who burst out in song and give you the extra push to make it to camp. The ones who share sweet treats, water, body heat, firewood, you name it. The ones who get up early enough to wake the entire group up. The ones who make the trek back to vans with people who need to be evacuated. The ones who, in whatever small way, remind you that you could do it and you’re almost there. The ones who show up for you when you forget to remember you needed to ask for help. The ones who make you laugh when all you want to do is cry. The ones who call for layer breaks every 5 minutes. The ones who break trail for you and who yell “fly backs”. The overachievers and the stragglers. You’re appreciative of the people and the teamwork. Then there are the things: the quietness of the woods, the first sign that you’re nearing camp, the peak of a mountain and the view that reminds you that God took his/her time when designing this world, the fire after a long and cold day, the fire after a long a cold night, the sleeping bag and two bodies on either side that keep you warm, the “just add hot water” oatmeal packets, and I’d imagine the view of the Common and the welcome party to signal not only the completion of Expedition but your survival. You’re appreciative of the Expedition dinner and stories that get shared about falling into streams, getting frostbite, socks and boot liners falling into the fire, people tripping over and face planting in snow, water bottles melting when hot water is poured into it. You enjoy the stories and give yourself a slight pat on the back for doing that thing you, perhaps, like me, never thought you’d do, or the thing your challenged yourself to do. You did it, you didn’t die, you have stories for days and you’re among a sterling (all pun intended) group of people. You understand that you are never as alone as you may think. You understand that every person has their role in the woods and in this thing called life. You understand that communication is key and so is taking a minute to blow steam off before responding to something that angered you. You understand that things get tough, life gets hard but you must push through as best as you can and ask for help when necessary. You understand that you look out for yourself and the people around you. You form connections and community. You pay attention to what’s happening. You pause and reflect. You see beauty in otherwise mundane things. You push through and pray to your God that you make it and when you do, you take those lessons with you through life. I don’t know if those were the outcomes the originators had in mind when they designed Expedition, but for me, it was one of the best lessons I didn’t know I needed. It connected me to myself, to the people and to the place.